Second Futbol: Play SL Soccer at Jericho Hill Sports Complex and join the Fun! Want to play soccer in Second life and meet new people from around the world? Teleport to Jericho Hill Sports Complex and join the fun! We are open 24h/7 and invite you to create a funmatch with your friends or with other people who love to play with the soccer system. Get the latest news about our soccer system by joining our group! Also, you can soon create your lovely soccer club team and your preferred national team without any cost! 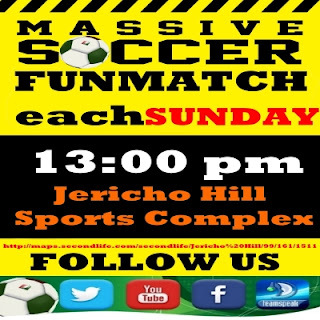 join us every Sunday for a Massive Soccer Funmatch!